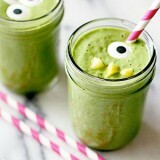 The Green Monster smoothie is packed with the super nutritious green vegetables. I'm thinking it has a lot to do with the way I serve it. Fresh and sweet, these monster smoothies not only look back at you, they're deliciously healthy!